Fresh from launching its new 2014 footwear collection at EICMA TCX will be showcasing the new line-up at Motorcycle Live, at the NEC, Birmingham. 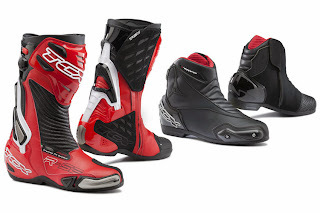 boots; S-Speed WP, Track Evo WP, X-Ride WP and the X-Rap WP for 2014. Launched last year, the R-S2 has undergone a re-style for 2014 and is now the R-S2 Evo. The re-style includes the addition of TCX's new Fasten Fit Control (F.F.C) system, which is an internal fastening system where long laces are sewn to the lining of the boot. It ensures that the upper part of the boot wraps around the foot providing maximum fit, precision and sensitivity. It also has a new elastic insert for easy-zip fastening. The R-S2 Evo is now available priced at £289.99 and available in black, red or white. The X-Roadster WP is a low-cut sports boot with all the main technical features and the look of a racing boot. It has an easily interchangeable polyurethane front slider and a reinforced polyurethane heel. The upper part of the boot is made from various materials including, opaque microfibre with a 'soft touch' effect and 'carbon look' finish, while the inner-part is made of chamois leather for increased grip. The inner lining is water resistant so the boot can be worn in wet weather. There are reinforced areas on the malleolus, tip and heel and the racing styled sole offers excellent grip. The X-Roadster will be available in dealers from mid-December priced at £129.99. The X-Square Evo WP is a short casual-styled boot that offers full CE certified protection. It has a reinforced heel and toe, a thermoplastic malleolus insert, as well as a thermoplastic footbed, which ensures transversal rigidity according to CE regulations protecting the foot from being crushed in the event of a fall. The upper of the boot is made from wear resistant fabric and has a reflective strip on the rear to increase visibility at night. The inner lining is waterproof and the Velcro ban fastener secures the laces to avoid them becoming tangled. The X-Square Evo WP is now available and priced at £99.99. The X-Square Sport has been designed to offer a sporty look that offers comfort and protection for longer rides. The boot has a combination of materials; the upper includes a 'soft touch' effect and opaque microfibre. The rear has 'carbon look' microfibre with chamois leather for improved grip, as well as mesh fabric on the collar for comfort. The structure has numerous microinjections and a 3-D front slider that gives a sporty attractive look. For hotter days the Air tech lining offers breathability and airflow. The X-Square Sport is now available and priced at £89.99. There is a Waterproof version, which will be available from December, priced at £99.99. Bringing a fresh new look to TCX's extensive footwear collection the X-Rap is a casual-styled shoe that offers high levels of protection, with full CE Certification. It has a reinforced malleolus, toe and heel area, a heat-formed footbed for increased protection, a high-wear sports sole as well as a removable anatomical insole. For wet weather there's a waterproof membrane. Also available is the X-Rap Lady Waterproof, which is specifically designed and shaped to fit a female foot. The X-Rap comes in various colours including black, grey and brown, and blue/fuchsia for the female version. The X-Rap WP and X-Rap Lady are now available priced at £129.99. TCX's off-road option, the Pro2.1, has had two new colours added for the New Year - white/orange and black/fluo. The Pro2.1 has been designed to challenge extreme conditions and features TCX's off -road T.C.S. (Torsion Control System) and a highly breathable anatomical inner bootie. It has a reinforced shin plate - with embossed logo - a polyurethane toe and heel protector, as well as a toe steel cap, inner rubber heat guard and ankle/malleolus protection. The new Pro2.1 colours will be available in dealers from February 2014 priced at £329.99.